A fine Victorian era, gentleman's sword cane, Toledo. 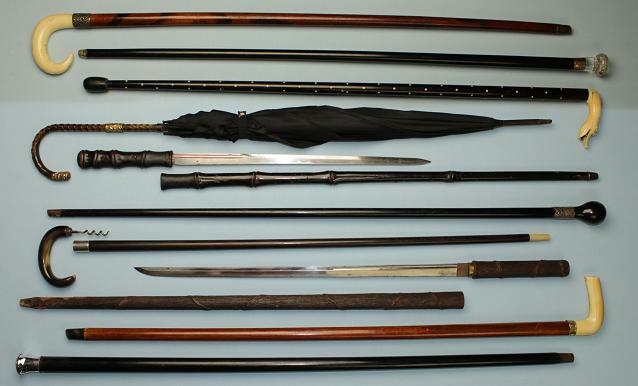 By far the most famous blades known in Walking sticks were those from Toledo, Spain. This example is likely English assembled for the European market with the finest of blades and Malacca cane shaft. This walking stick or walking cane measures just over 87cms long. Drawn, the sword is 85.5cms long, with a blade length of 69cms. The fluted spiral top is silver plate, with the plating now worn with age. It sits atop of a two piece Malacca cane shaft which acts as the hilt and houses the blade. The Toledo blade is single edged and bears a frosted acid etched panel to one face. The supple blade has a single fuller to each face and a full tip. Its surfaces remain in original bright finish. 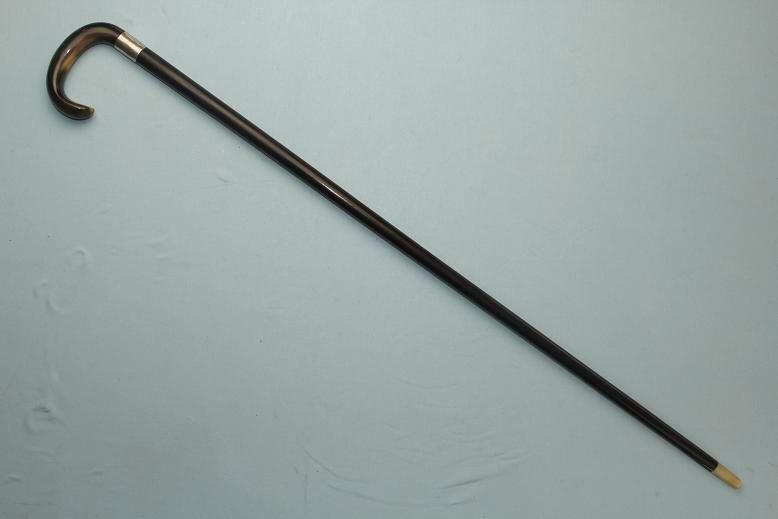 A quality sword cane for the European market. A very fine early 20th century carved walking cane from New Zealand in Maori style. 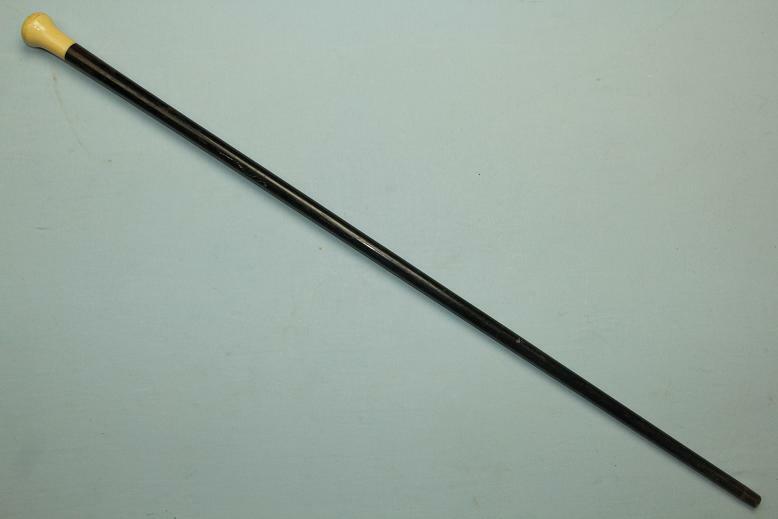 This cane measures 92cms long and 4.5cms wide across its handle. The timber is a beautifully patterned type of New Zealand native timber. Below the bulbous handle is 20cms long section displaying Maori designs and Tiki like faces. Each face has round Paua shell inlay eyes and a protruding tongue. The shaft tapers gently to the base where an old original, long steel and brass ferrule remains intact. The steel tip of the ferrule is approx 1cms long with the ferrule being 4cms long. 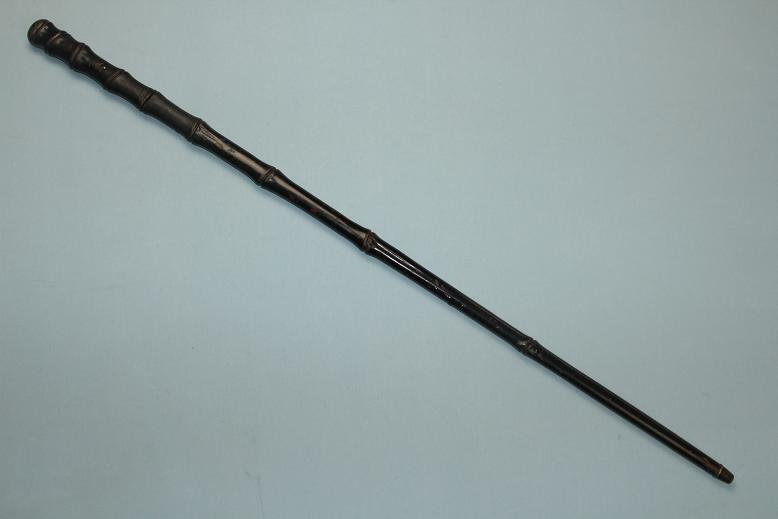 A very nice and well priced example of a Maori influenced walking cane likely made for the local or European market. A good Ivory, silver and Malacca walking cane. This cane measures just over 93cms long. The Ivory sphere is 35mm in diameter and sits within a crown like silver cup and collar. The shaft is made from Malacca cane. The upper third of the cane retains a fine warm old patina with the bottom two thirds now discoloured by age and use. The base of the cane ends with a hallmarked silver ferule. An attractive cane that will grade up well with little effort. A fine crystal topped dress cane. This cane measures 90cms long. The handle is a faceted and cut crystal top encased within a decorative 9ct rose gold band which also carries the makers initials, WHC. One half of the canes gold band is blank for a dedication or presentation. The top sits upon a dark ebonised shaft that tapers to short white metal base. A very attractive dress cane with a seldom seen crystal top. 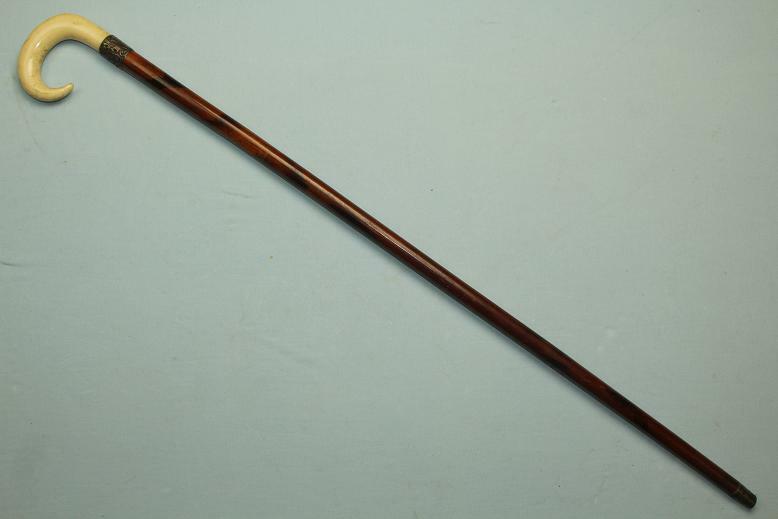 A simple and elegant Rosewood and ivory dress cane. This cane measures 93cms long. The top is a well shaped handle that displays a pleasant age patina. The shaft is an ebonised Rosewood type. The upper 5cms has the ebonising worn away to show a very fine Rosewood timber. The cane would benefit from a re application of the ebony colour or equally, a removal of it to display a very finely grained shaft in its natural state. The ferrule is a horn type, an indicator of a quality cane. A fine, well presented and well priced ivory topped cane. A rare Sambok walking cane. 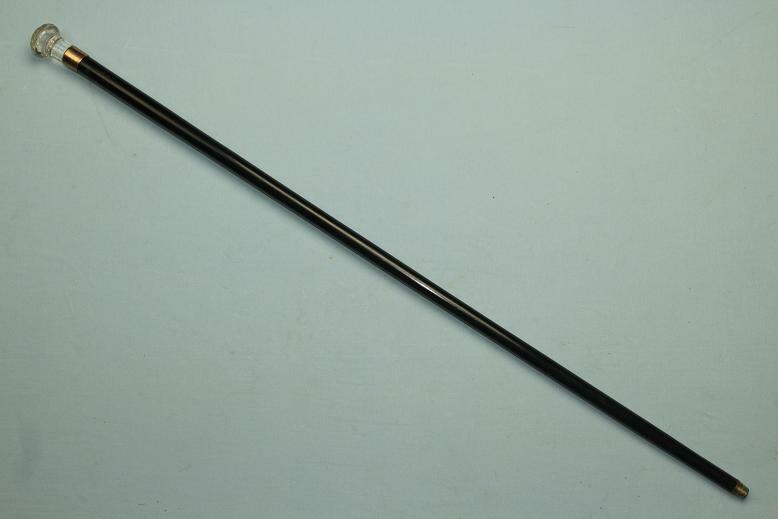 This defensive cane measures just under 94cms long. It is entirely encased in thick leather and is very well stitched to one side. Within the leather casing would be a flexible steel rod, likely wrapped in twine and then encased in leather. Designed to be used like a whip, 20cms up from the bottom of the cane is a raised ring, obviously placed to inflict further pain. The ferrule is a long brass type that carries a steel tip. A wrist lanyard is present but detached on one side, something that a simple stitch could restore. 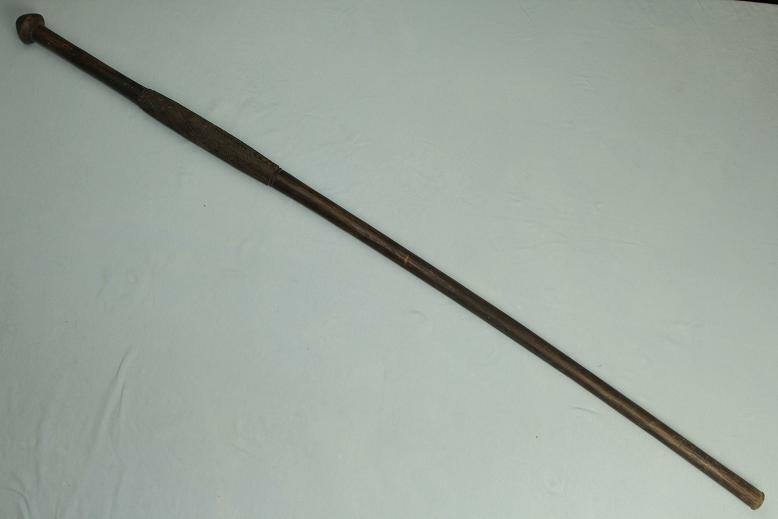 A rare defensive cane, likely from Colonial South Africa. 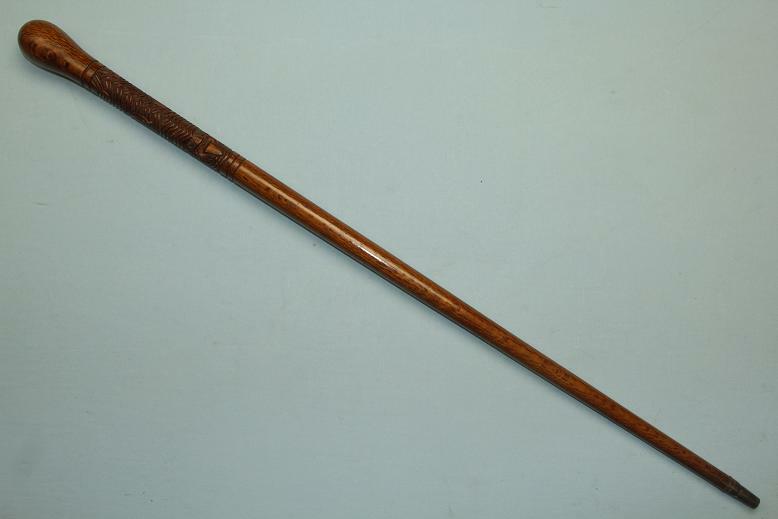 A fine Malacca cane walking stick with an ivory crook handle, dated 1885. This cane with provenance has a repousse hallmarked sterling silver collard. To the outer side of the collar is a large shield containing the script, "TO R.E. DEANE ESQ M.D. DEC 25th 1885". The ivory crook handle shows a warm age patina and is in exceptional condition. The shaft is a teardrop Malacca cane, showing a deep honey colour to its surfaces and darker mottling throughout. The base is tipped with a well used brass and iron ferrule. A fine cane with good research potential. A fine and unusual riding crop with a concealed blade. This crop measures 52cm closed. Drawn it is 42cms long with a blade 24cms long. Likely from the early 20th century, the exact use of these crops is unknown other than personal protection when in the field, certainly a surprise for any attacker. The grip and ball pommel are plaited leather straps over what is likely a timber core. The sheath is plaited leather like material over a rolled metal sleeve and ends in a short leather strap. The blade is rectangular in form and tapers to a very sharp tip. A rare item in very good condition. A good English Rosewood sword stick with a fine Toledo blade. 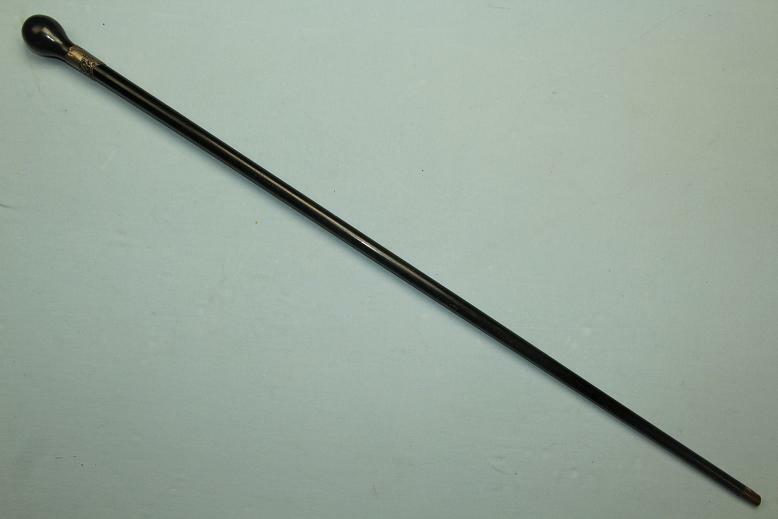 This sword stick measures 91.5cms long together. When drawn the sword is 87cms long with a blade length of 70cms. The bentwood handle and shaft are a finely grained Rosewood. There are losses to the original lacquer on the handle and partly on the shaft and there are also fine age cracks on the handle. The base of the stick is a fine blonde horn ferrule, indicative of a higher end walking cane. The blade is a supple single edged Toledo manufactured type. There are edged panels to each side of the blade that contain the word "Toledo" which is surrounded by vine motifs. A good original old sword stick circa 1900. A good old original African walking stick. This original old hand knapped and carved walking stick measures just under 101cms long. The top of the handle is a tall domed mushroom shape showing a worn hand knapped surface. The shaft does not appear to taper other than the points leading in to and away from the thick carved section to the upper part of the stick. The base is worn and flared from much use and all surfaces of the walking stick show a hand knapped finish. 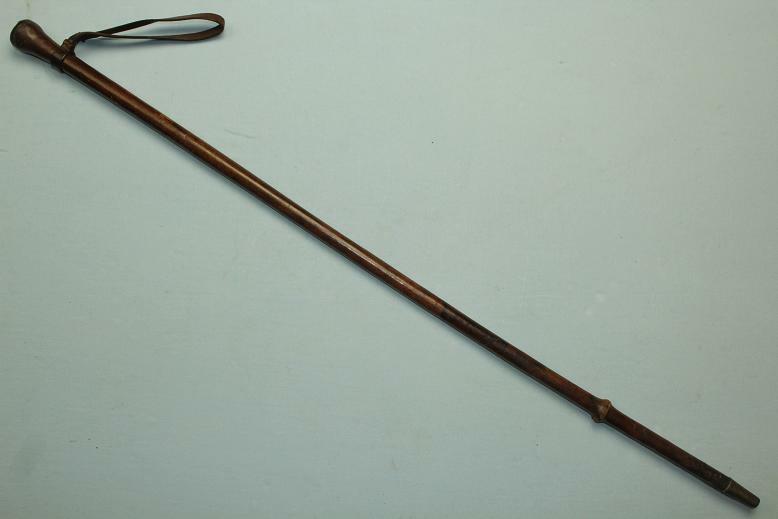 A good original old African walking stick, likely from the first half of the 20th century, perhaps earlier. A very fine wine related walking stick, gadget stick. This example measures 85cms long. The crook handle is made from a very fine multicloured polished horn. It has a wide end being 3cms and tapers to the hallmarked Sterling silver collar. The markings to the collar are "J?&S", The lion standard symbol, a small "r" and a anchor, dating this cane to 1916 from Birmingham. The crook handle unscrews on a very fine thread to reveal a pull cork screw. The shaft is a very fine gained Rosewood and ends in a blonde horn ferule, an aspect typically associated with high quality canes. A very fine and rare gentleman's walking cane that is seldom seen today. 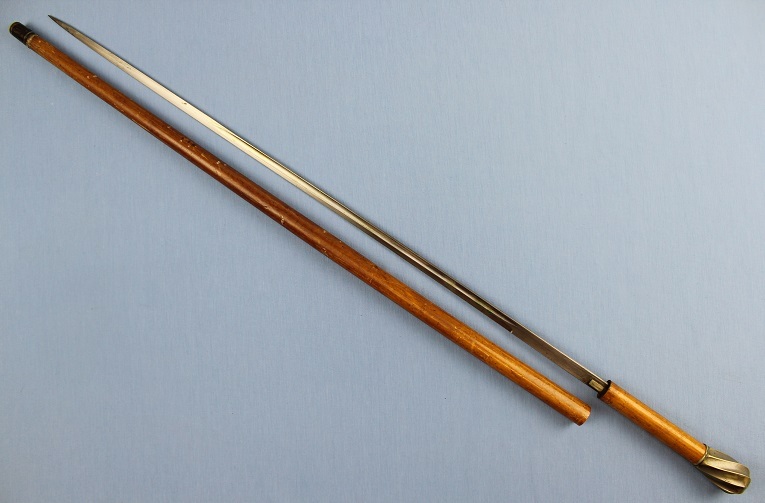 A good and unusual Japanese sword cane. 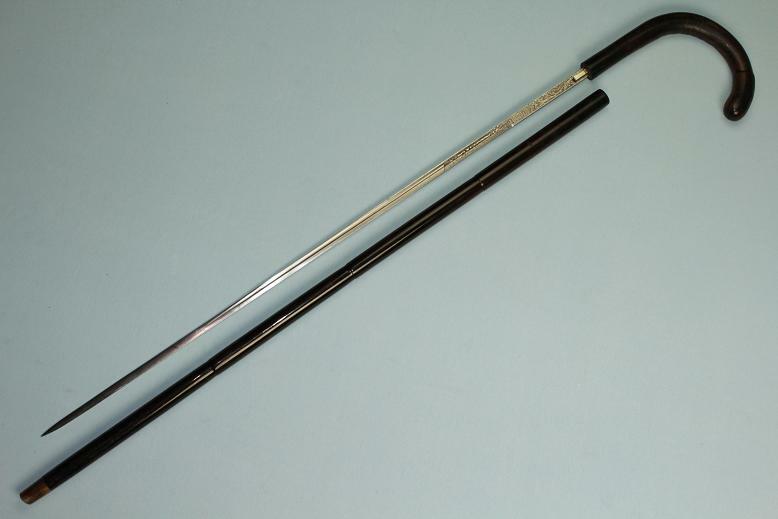 This example of a Japanese sword cane measures 90.5cms long overall. Drawn from its sheath it is 59.5cms long with a blade length of 43.5cms. 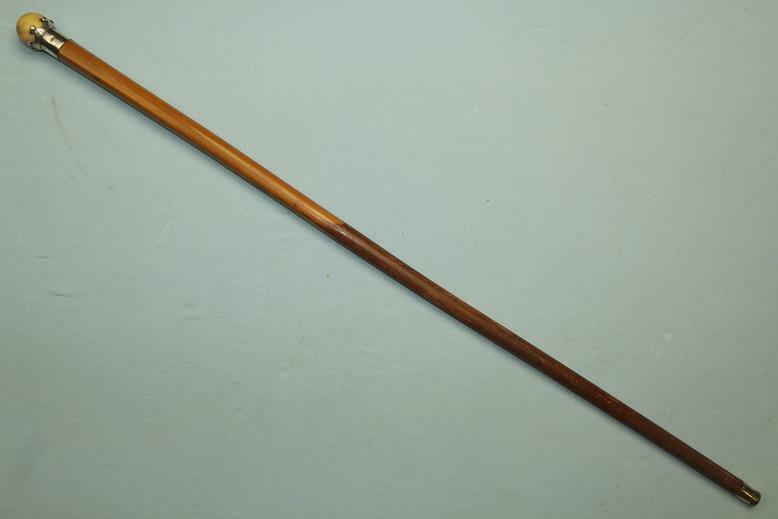 The cane is timber carved to represent bamboo. The sheath is made by the split wood method, being two halves section out and resealed. The blade is secured within the hilt by a copper mekugi pin. The blade is very well made and shows unusual asymmetrical fullers sealed in red lacquer. The blade is sharp and retains a full tip and although not seen in the photographs supplied, it does have a very clear Harmon despite being out of polish. 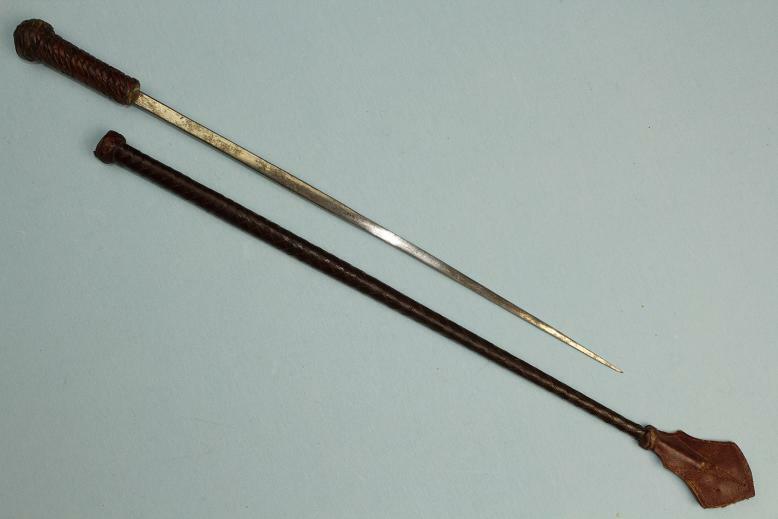 A good collectable sword cane with a rare Japanese blade.